Get the power of business-class telephony features as available with large systems such as mobility, teleworking, voice mail, auto-attendant, shared lines, remote extensions, web-based management and lot more. Consolidate wired and wireless data networks together using built-in Wi-Fi access point and 8 Port LAN Switch to simplify deployment and management of IT infrastructure. Also routing features such as port forwarding/triggering, NAT/STUN, DHCP server, static route and quality of service eliminates the need to install external data routers. Ensure seamless business continuity with multiple options for internet connectivity. Ethernet, 3G/HSPA embedded modules and USB modems are supported with auto fall-back options. Enable wireless access to voice and data services on laptop, mobile handsets and tablets. 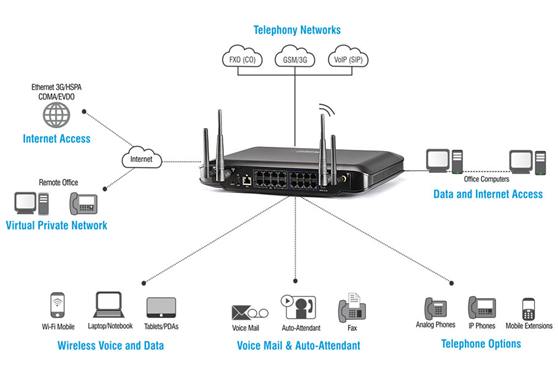 With built-in Wi-Fi connectivity, users can surf internet, make/receive calls using VoIP/GSM/PSTN lines, share presence and IM while roaming anywhere in the office. Stay connected with business communications even in non-availability of leased line networks. Embedded GSM3G modules and USB modems connectivity helps users to make/receive calls and surf high speed internet on mobile phones, laptops and PDAs. Extend secure access to business applications and information with central offices, remote workers and partners. Standards-based SSL/IPsec/PPTP/L2TP VPN tunneling protocols makes CNX200 inter operable with other VPN enabled devices. Turn any Android phone or iPhone smartphones into office extensions. It delivers entire portfolio of call management features such as dialing by extension number, caller ID, call hold, transfer, 3-way conference and voice mail access on Android/iPhone smartphones. Empower users to stay in touch with business communications from any part of the world. Users can flexibly select from IP phones, PC soft phones, analog phones and Android/iOS smartphones as office extensions. Δημοσιεύτηκε στην κατηγορία MATRIX BUSINESS iPBX, VoIP ΤΗΛΕΦΩΝΙΚΑ ΚΕΝΤΡΑ με ετικέτα all in one ipbx, best small pbx, modern pbx, navan, office in a box, VoIP, VoIP PBX, ολα σε ένα PBX, ολοκληρωμένο σύστημα, Τηλεφωνικό κέντρο. Σώστε σε Bookmark το σύνδεσμο .